While looking on Google maps at something else I stumbled across a place called De Orchideeën Hoeve and clicked on the website to see what it was. 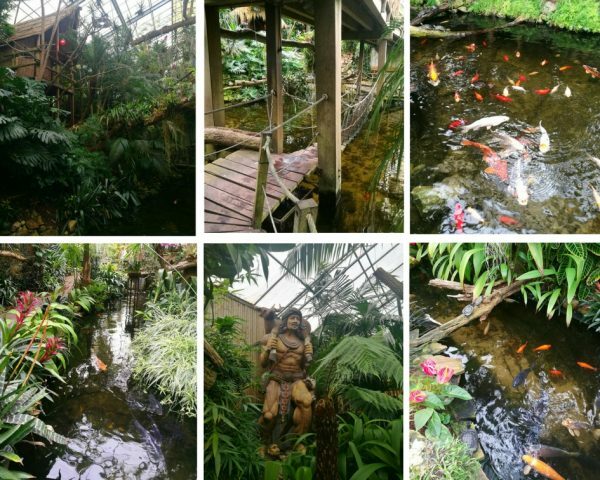 Lo and behold, I had found an amazing-looking indoor tropical garden complete with gorgeous flowers, a butterfly garden, rainbow lorikeets, fish, iguanas and monkeys! And it was all only a half-hour drive from Lelystad! I immediately made plans for us to go and see it during the holidays and here is a taste of the all the fun we had exploring this tropical paradise. De Orchideeën Hoeve is located in a big shed about ten minutes out of the town of Emmeloord in the province of Flevoland. Unfortunately it’s not very easy to get to unless you have a car, since trains don’t run to Emmeloord so if you were going by public transport you would need to get a bus from Lelystad (the 140 bus goes every 30 mins and takes 40 mins to get there) and then another bus from Emmeloord to De Orchideeën Hoeve (bus 76 goes once an hour and takes 20 minutes). Plus if you were coming from Amsterdam it takes about an hour on the train to Lelystad so all in all, it’s a bit of a mission. BUT if you have a car it’s easy peasy, and if you need to hire a car you could combine your trip to De Orchideeën Hoeve with a trip to Giethoorn as well to make a very nice day-trip from Amsterdam. There’s lots of free parking on site at De Orchideeën Hoeve and entry costs €12.50 for adults – or only €12 if you buy your tickets online beforehand! 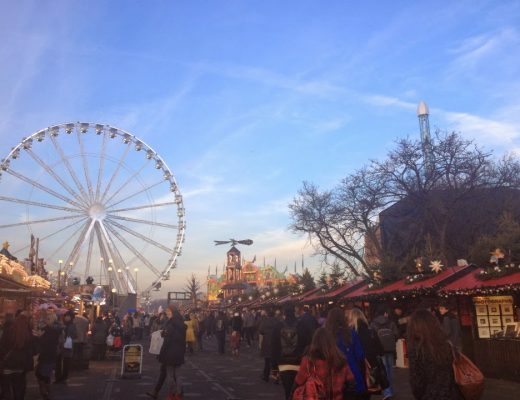 Once you arrive and either buy or show your tickets you will gain entrance into this enchanting and unique place. Wear light clothing as it is very humid inside the building, it’s a tropical paradise after all! In the Amazonian Rainforest garden you will wander amongst greenery and stunning flowers and watch the huge koi swimming through streams along with numerous little turtles throughout the area. 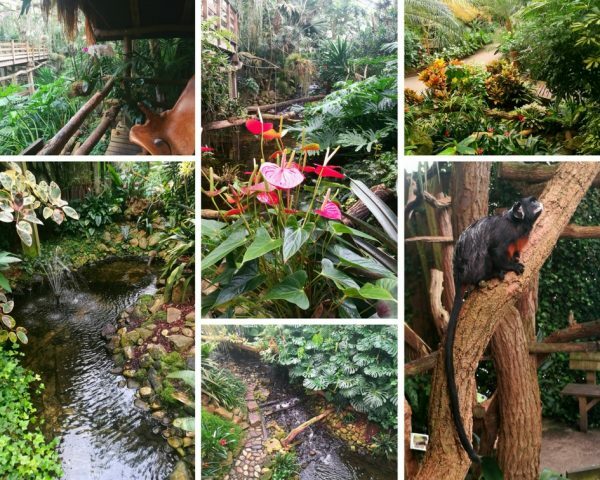 The complex is huge, and quite inspiring how many secret little nooks and crannies they have managed to cram into the space to make it feel like an actual rainforest! There are also monkeys in this part of the gardens! Well, technically, they’re White-Lipped Tamarins and White-Eared Marmosets which are types of very tiny (and very cute) monkeys from South America. 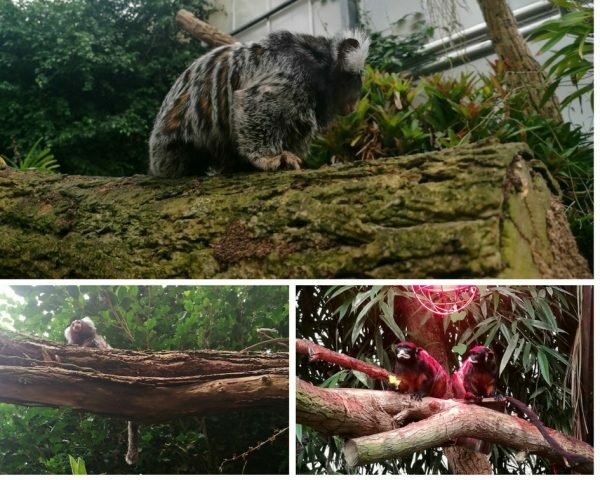 We discovered the marmosets dashing about in the trees above us and we also saw some tamarins laying under a heat-lamp enjoying some fruit. They were definitely a highlight! There are all sorts of different ways to walk and explore including completely accessible routes and also little trails where you can clamber down over rocks and even cross a slippery plank bridge under the main bridge. 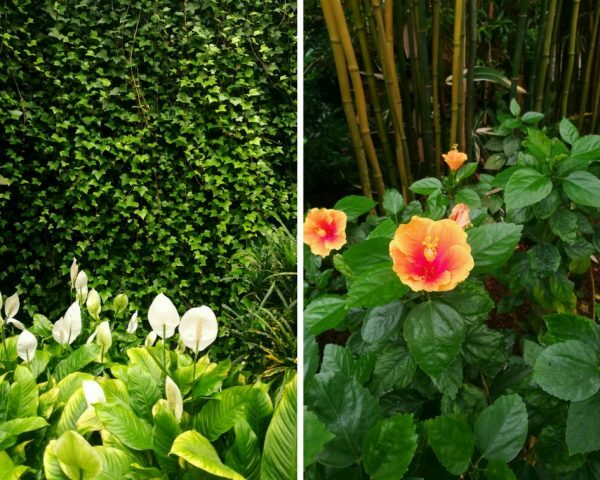 There are so many different plants and flowers, ponds, streams and fountains to see. It’s a photographer’s dream and also, I would think, absolutely enchanting for children to pretend they are exploring a jungle! Or for the young at heart, like me! So many gorgeous sights, I took hundreds of photos! 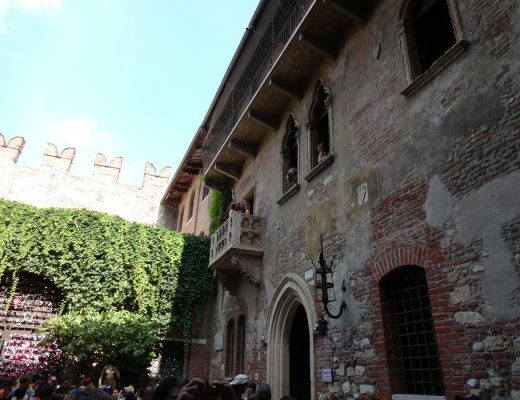 You can easily spend hours wandering around and exploring! 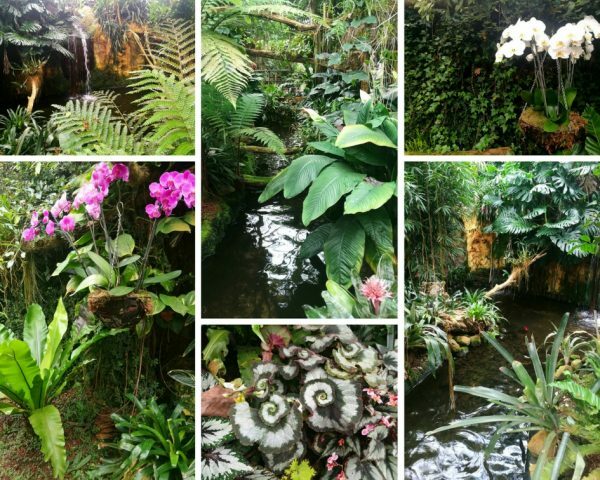 After wandering around the rainforest the path leads you into the Orchid Garden, which is still tropical and filled with pools, fish, turtles, streams and flowers, just with more orchids obviously! There are mossy caves to explore here, and you can see the turtles eating from little dishes or purchase small handfuls of fish food to feed the koi. Apart from the orchids and lack of monkeys it’s fairly similar to the Rainforest garden, and just as beautiful to explore. In the Lory Garden you can get up VERY close and personal with Rainbow Lorikeets from Australia! The Dutch call them Rainbow Lory’s but in Australia we call them Lorikeets. 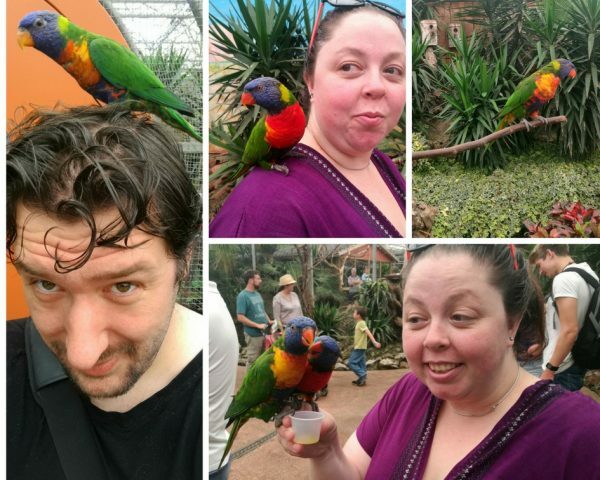 You pay a euro for a little cup of nectar and as soon as you walk into the enclosure the colourful birds immediately fly onto your arms and shoulders (or head in Dennis’s case – even though he didn’t have any food!) to have a snack. They are not at all afraid of people and will happily pose for photos. I had to walk over to a branch and sort of shrug to get the one on my shoulder to hop off again! I have memories of feeding these in Sydney when I was a kid, so it was a bit of a kick for me to see some of these native Australian birds here in the Netherlands. 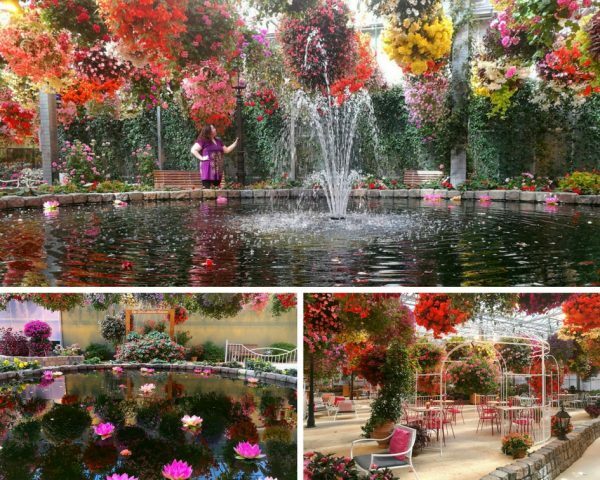 After the Lory Garden you walk into what is apparently the largest butterfly garden in Europe! It is very large and there are lots of butterflies, although it’s not easy to get good photos of them since they rarely stop moving. In this garden you might also see a very big iguana, although we missed out on seeing any (or it?) during our visit. You can actually have weddings at De Orchideeën Hoeve, there’s a cute little grotto in the butterfly garden for ceremonies. It would be pretty magical to have butterflies released as you had your first kiss as husband and wife! After the butterfly garden you walk through the nursery and can see lots of young plants before coming to a pretty impressive play area for kids. Continuing with the jungle theme this spot has tonnes of fun looking things to climb and explore before you arrive at the beautiful suspended flower garden. 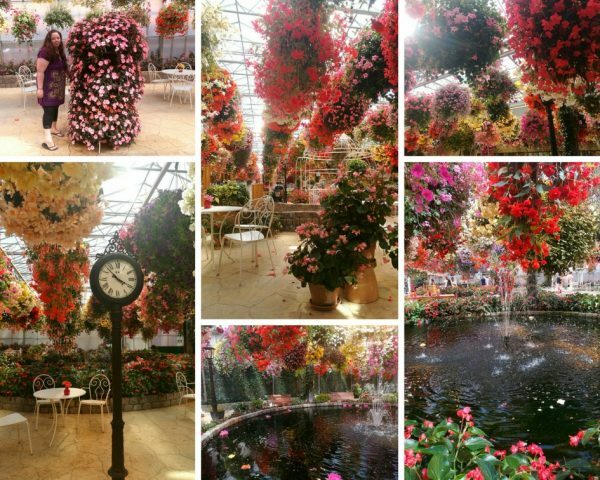 The last main part of the complex that you come to is the show-stopping suspended flower garden. This magical area is absolutely covered in bright flowers in hanging baskets and features three ponds, little arbours and lots of idyllic seating areas for you to stop for something to eat and drink, or just to take in all the beautiful colours. There’s even swinging love-seats and a white grand piano! When we arrived there was a lady playing movie theme songs on the piano which only added to the peaceful, magical ambience as we relaxed with a drink. Overall I was astounded that such an amazing complex of gardens exists so close to us in the Netherlands and I had never heard of it before! It really is a stunningly beautiful and very interesting place for a visit (or a wedding, or a photo-shoot!) and I would definitely recommend you visit if you are in the Netherlands (this is not a sponsored post either). 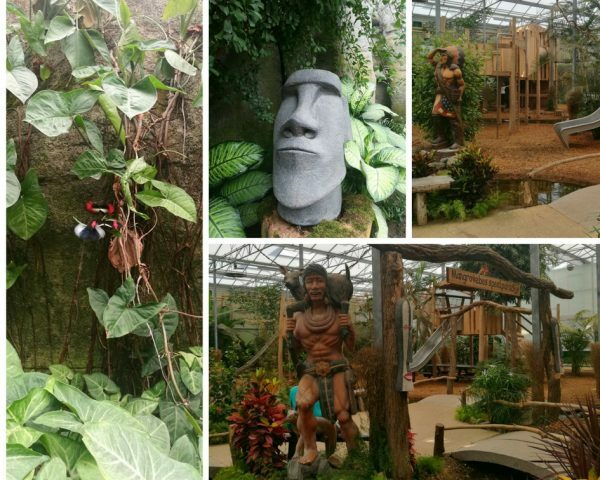 For more about the fun things I have discovered while living in this surprising country make sure you check out my Netherlands destination archives and of course, the website for De Orchideeën Hoeve for more about this gorgeous and unique site. 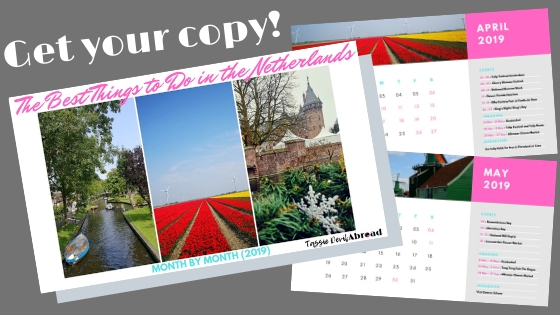 Want a free calendar of events in the Netherlands month by month? 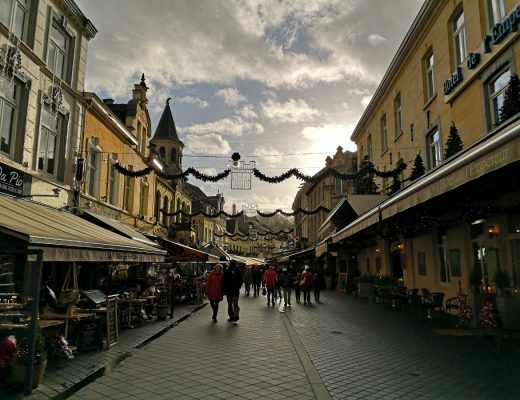 Did you have any idea such an amazing place existed in the Netherlands? Let me know in the comments if you’ve been here or would love to go and don’t forget to save this (pin it!) for later for your own planning!